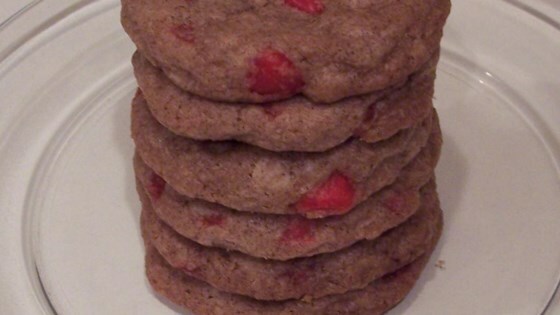 "A twist on a white chocolate toffee cookie recipe: added cinnamon to the dough, and replaced the white chocolate chips and toffee with cinnamon chips and imperial Red Hots®. These are a hit with family and friends!" Mix flour, cinnamon, baking powder, baking soda, and salt together in a bowl. Beat butter, brown sugar, white sugar, and vanilla with an electric mixer in a large bowl until smooth. Beat in the egg until completely incorporated. Gradually beat flour mixture into butter mixture until combined. Fold in cinnamon chips and cinnamon candies, mixing just enough to evenly combine. Drop spoonfuls of the dough 2 inches apart onto ungreased baking sheets. Bake in the preheated oven until lightly browned, 8 to 11 minutes. Cool on the pans for 2 minutes before removing to cool completely on a wire rack. Cinnamon can be increased to taste. You can find bulk cinnamon candies online by searching for "imperial red hots".